Our exotic assortment of Floral Series includes Violet Incense Stick that emanates a heavenly fragrance preferred by different religions. It is made using aromatic flowers and premium grade ingredients which offer an unique and soothing fragrance. As a result, it is widely used during prayers, spas, aromatherapy centers, and many other health care institutions. This floral fragrance based Incense Stick burns for longer period of time till all the rituals are performed. 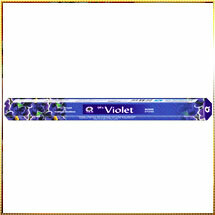 We have made this Violet Incense Stick keeping customer preferences in mind. Herein, purity has been stringently focused on the terms of ingredients. We have taken care for precise length and thickness of the Incense Sticks which help them burns for longer period of time. Additionally, proper packaging is assured to retain the quality including fragrance of the sticks for long time.